Helo pawb, BLOD yma. Hwn yw fy nhrydydd diwrnod fel y blogwr gwadd. Mae’n hwyl! Mae nifer o bobl wedi gofyn i gael clywed rhywun yn siarad Cymraeg, felly mae fy mhrifathro wedi recordio Niamh o Flwyddyn 6 wedi yn darllen y paragraff am fwyd heddiw (mae hi wedi bod yn dysgu Cymraeg am hirach na fi, diolch am dy gymorth, Niamh)! Ydach chi’n cofio nes i ofyn i chi ddyfalu pam dwi’n cyfri sticeri bob dydd? Roedd un person yn agos iawn. Weithiau mae staff y gegin yn cuddio sticeri o dan un plât ar hap. Rhaid i ni edrych o dan ein platiau i weld pwy sy’n cael sticer. Os ydych chi’n ffeindio sticer, rydych yn ennill gwobr. Mae hwn yn ein hannog i fwyta cinio ysgol. Mae’n rhaid bod yn ofalus peidio gollwng bwyd ar ein pennau wrth edrych! Heddiw fe wnaeth dau berson ffeindio sticer. Cawsant raw fach i’r ardd a phecyn o hadau. Fe allwch weld llun un o’r bechgyn yma. Heddiw cawsom ginio o gig eidion. Cig eidion Cymreig oedd o. Cawsom datws rhost, pwdin Sir Efrog, moron a bresych hefo grefi a bara. Roedd yna datws stwnsh hefyd ond dydw i ddim yn hoffi tatws stwnsh. I bwdin mi ges i deisen ‘rice crispies’. Ar y fwydlen ei enw ydi ‘Krispie Aur’. Dwi’n meddwl ei fod yn cael ei wneud efo triog a syrup. Mi roedd yn fendigedig. Hello everyone, BLOD here. It’s my third day as the guest blogger. It is fun! Lots of people are interested to know what the Welsh language sounds like so my headteacher has recorded Niamh from Year 6 reading the paragraph about today’s food (she’s been learning Welsh for longer than I have – thanks for your help, Niamh)! I asked you to guess why I’m counting stickers didn’t I. One person was very close! Sometimes at dinner time the dinner staff put a sticker underneath someone’s tray at random. We all have to look under our trays to see who gets the sticker. If you get the sticker you win a prize. 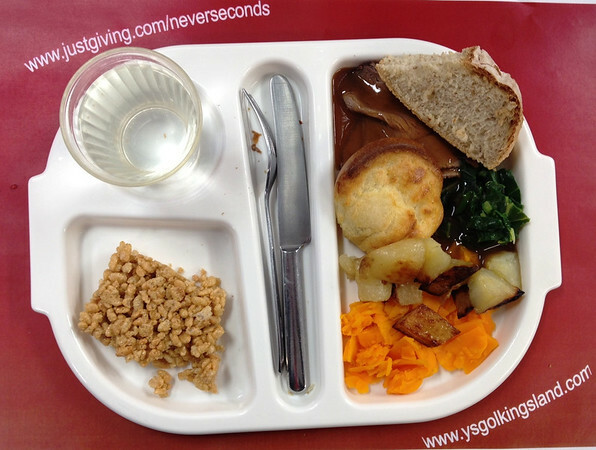 This encourages us to have school dinners. We have to be careful not to spill any food on our heads when we check! Today two people found a sticker. They won a trowel and a pack of seeds. You can see one of the boys here. Today we had a beef dinner. It was Welsh beef. With it I had roast potatoes, Yorkshire pudding, carrots, and cabbage with gravy and bread. There was mashed potato too but I don’t like that. For dessert I had a rice crispy cake. On the menu it is called a Golden Krispie. I think it is made with treacle and syrup. It was delicious. The picture I'm sending you shows my lunch today at the Muslim canteen at my uni (Xiamen is a sort of quiet little town located on the southeastern coast of China), where you get a helping of steamed rice for free and pay for the specific dishes that go with it. 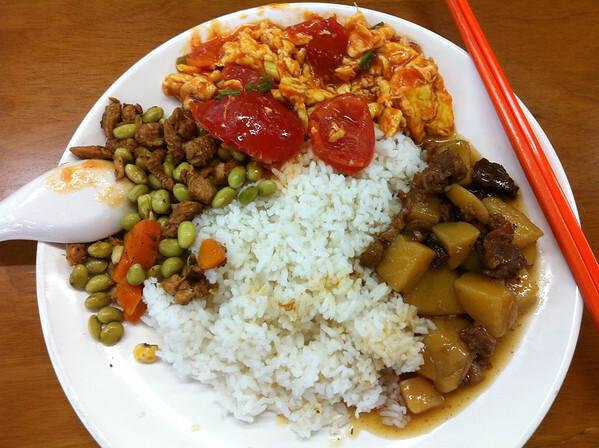 I got scrambled eggs with tomatoes, chicken and green pea stew and potato and beef stew. Then you get funny carrot-coloured chopsticks and a spoon, which I think is indispensable since it's impossible to eat rice or peas with chopsticks! BLOD here once more. I think the scrambled eggs with tomatoes look really nice but at first I thought it was chicken. I’m not a fan of scrambled eggs though. I would really like to try the chicken and green pea stew though! I’ve seen spoons like that in the Chinese restaurant in Holyhead. When I go there I try to use chopsticks. I’m getting there slowly! Once, when I was about 7 years old we had a Chinese Day in school. There is a picture of me here – I’m the one on the left! we here think you're doing a great job whilst VEG is away! Thanks for posting interesting stuff about your country and language, too! You are very cute, Blod! I would have given your dinner a 10/10 (although I would have gotten the mashed potatoes instead of cabbage). I love Yorkshire pudding and you just don't see much of that in the states! Sometimes I buy a mix to make it and it's pretty good. If you want to learn to use chopsticks practice by picking up peanuts in the shell. WoW! I think you are doing a great job! Your lunch looks really yummy. Maybe you will get a sticker tomorrow. Good Luck from Seattle, Washington USA. I hope VEG is having a nice break! Boridah Blod you are doing an excellent job standing in for Veg. Your meals look wonderful, I used to work in a school, and have to say the school dinners were rubbish. Your's look excellent. As for Welsh, boridah is my limit I'm afraid. Scrambled eggs and tomatoes, I'm not to sure about that, I'd give it a go, but it doesn't sound tempting. Keep up the good work Blod, I've really enjoyed your entries. Thank you, Blod, for picking up Veg's posting! It is one of the highlights of my day. I'm American, from the state of Georgia, and I'm 59 years old but still remember school lunches! Some were pretty good, they were always balanced and pretty healthy, but I do have a strong memory of "mystery meat!" That's what we called beef patties that looked foul :-) Keep up the good work! I ran away from school because of the school lunches, cabbage boiled for hours would make anyone run away! Wow, great idea to record some Welsh, I hadn't heard it before. You're doing a great job, Blod! Nice post, Blod! I especially like that you posted the audio. Looking at the Welsh in print is quite funny to me, so it was great to hear what it sounds like. I,like Dorothy, have been out of school for many years! I am 56 yrs old and live in Kissimmee, Fl USA. School lunches in elementary years, (1-6) were always available for purchase but most brought their own lunches. We would purchase milk to go with ours. Great work Blod :) I used to have school dinners, but I only really remember having turkey burgers and cheesey chips! You and VEG are alot more healthy! Great job! Welsh is so interesting.. I love it that you included a recording of the paragraph being read. Nice to include a picture of yourself too, you're a cute little girl! :) Keep the nice dinners and fun facts coming. Thanks to Anthony Turner for hosting the audio. My husband and I live in Swansea, Wales and it was most exciting to hear someone speaking Welsh. You are wonderful job as a guest blogger! It's very inspiring to see that kids at your age are so concerned about the rest of the world. Grown ups could sur take a lesson from you in terms of sensitivity and generosity. Keep up the good work. God bless! I am half Welsh and worked on Anglesey for a time after leaving university in Bangor so good to hear some Welsh again. Unfortunately I don't speak the language, just recognise bits. The one Welsh phrase that I often use is "popty ping" (and it is food related!). Popty Ping is my favourite Welsh term! Closely followed by sboncen and cwtch (unrelated as they are to food!). That might be the longest name of a place anywhere in the world! I love it. Thanks for all the great links to the photos (you're adorable) and the MP3 of the Welsh language. It's so lovely. I like the Welsh accent, too, as heard in the BBC show Torchwood, which we love to watch here in the U.S. (Detroit, Michigan area) courtesy of Netflix streaming video. The dinners look simply delicious. Thanks to VEG, her family, and BLOD for the great blog and posts!! I can't believe that word at the bottom is a real word! I can't wait to hear it spoken. Wow! Welsh is a very interesting language. Thanks for that MP3. Hello, nice to read this blog everyday. Great work Martha and others. Will try and send a picture of the lunch in Indian schools as soon as possible. Keep going..
Great work on the guest blogging! Having the photos and recording of Niamh speaking are nice additions. Hope your day is going well. It is a sunny day (finally!) here in Seattle, Washington. The easiest way to learn how to use chopsticks is by using a rubber band to secure one end of the chopsticks. You can put a little piece of rolled up paper (such as the wrapper the chopstick came in) to create a little space between the two chopsticks. I missed reading this post yesterday because it was our Independence Day celebration, so my family and I watched a children's parade, had a BBQ at our house and went to a concert and firework show in the evening. Great fun! In Massachusetts there is a lake by the name of Chargoggagoggmanchauggagoggchaubunagungamaugg, a version of the Algonquin Indian name for the lake as a neutral fishing spot for two tribes, so was familiar with lengthy names while growing up. I think you've done a great job on the blog so far this week, and it's great for me to see what your having for lunch at school. I think alot has changed at ysgol kingland since I was there in the late 70's. All I can remember is lots of mashed potatoe and beetroot with cold meats! I'm just now (Sept. 9) reading about your lunches in Wales. My grandmother was full-blooded Welsh, but born in Ohio, USA. Just last weekend I was guest conductor at a Gymanfa Ganu held at Salem Presbyterian Church, Venedocia, Ohio. Is your full name Blodwen?